TIP #1 Make sure you have a BUYER’s AGENT. This does sound a bit self-serving however, bear with me. In other words would you take a knife to a gunfight? So now I (your buyer’s agent) am a big gun with lots of bullets (years of experience). “But does that cost me anything?” Most of the Time the Seller will pay the buyer’s agent fees, so “IT IS A FREE SERVICE TO YOU”. Make sure to see my blog article about choosing a Realtor. TIP #2 Close the TELEGRAPH OFFICE! We all send out both non-verbal and verbal messages…do not send unintended messages. An innocent comment about “We need to be in town by August 1st” might be misread to read “they really need to buy fast”. If the Seller or Listing Agent is present during your viewing of the property, your polite gushing about the condition of the home could also un-intentionally telegraph your motivation. When you go looking for a home remember to bring everything you need to get the job done: The Checkbook, The Loan Approval Letter; The Contract to Sell Your Existing House and any relocation documents. Seller’s should see every offer written on their home, even the one’s the Real Estate agent does not like or want to present. When you are ready to buy you look small and act like cash to the seller and that could affect his judgment. A pre-qualification letter can be authored by anyone. In essence it says “This guy should be able to get a loan, in my professional opinion. Signed Freddie at Matt’s screendoors handyman and mortgage services”. A LOAN PRE-APPROVAL letter will say something like: I have verified credit, funds and employment. I have submitted the file for pre-approval to our underwriting department and subject to getting the following items (appraisal, contract, current paystubs, etc.) these folks are approved up to X hundred thousand dollar purchase price. This approval is or (is not) subject to the sale of their existing home. NOTE: A loan broker cannot typically author this letter in good faith as he would not have access to an underwriting department. He would only have his “local” underwriter/processor not a mortgage company’s employee. TIP #5 Do not look at what you do not want to afford. This puts the head in charge, not the heart. What’s the Seller’s stated “reason” or motivation for selling? (a good listing agent will not tell you, unless there is a benefit to the seller).When do they need to move? What is included? Are there any other offers? Have there been any other offers? What have other homes in the area like this one sold for? How long has the house been on the market? What would I be expecting to get if I were the Seller? Will the condition of the property be a factor in any inspection and delaying the sale? An experienced BUYER’s AGENT will know how to engage either a Seller or a Listing agent in a conversation that may lead to some of these bits and pieces coming to the surface. Tip # 7 Does the seller have any “soft spots”. For instance, maybe they are elderly and want a nice family to own their home (look at family pictures) or perhaps a seller such as myself has a softspot for veterans. You never know but it is all a part of the detective work we do as a team. TIP #8 An offer is like a puzzle. Part A affects part D which attached to part Q which runs over to part H etc. Sometimes the puzzle is very complex, other times very straight forward. And as our society gets more and more complex, our real estate contracts have too. Tip #9 Write Contracts to be ACCEPTED, not countered. “The best way to get an offer accepted is to appeal to a Seller’s primary emotional tie to the property. Why? Because residential real estate transactions are put together — and sometimes blow up — over emotional hotbeds of insanity, lunacy and what often seems to be bipolar mood swings”. So it helps if you can identify the seller’s primary motivation in selling. 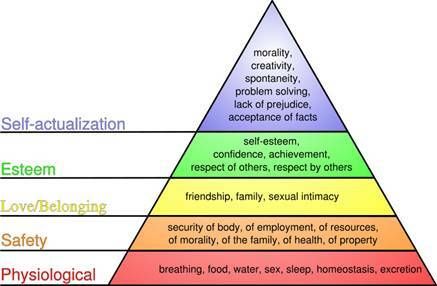 Maslow is just too deep for this discussion. There are only three motivations I found for selling a home Safety, Love & Esteem, as most folks have the physiological covered. A relocation might be Fear of losing a job (safety) or could be greed (esteem for the promotion) or could be Love (closer to family). So the Buyer’s agent needs to be a pretty good detective. A: Give the seller what they are asking? B: Make a lowball offer to the Seller. C: Use the sharp elbow approach. A. Well this is normally not an acceptable alternative, however there are times in every market when you might want to offer the seller “more than asking price” due to multiple offers so you can win the auction. This is always a dicey moment in time and the advice of a good Buyer’s Agent is critical. Sometimes it requires losing one or two “dreamhomes” before this tactic becomes acceptable. Buyer’s agents should be thrilled at getting lower prices for their buyer clients, it gives them performance bragging rights. B. This is one of the nation’s favorites and seems to be a preferred method. More often than not it upsets the Seller and often offends the Seller’s pride (esteem) and will certainly affect the amount of money the Seller received (greed/safety). A low ball offer offends both and does not incline the seller to be “reasonable”. There probably will be other sub-level motivational factors (relocation, divorce, death, family) however, a initial low ball offer can set the course to failure. I recommend you not waste your time creating offers that are not acceptable to the Seller. “Gee honey wasn’t our bottom line $X? This offer gets us within 2k? I really don’t like cleaning the house and getting it ready to show. You are gone all day at work and I get to take care of the kids. TAKE THIS OFFER! It is close enough!” (and a sharp elbow is planted in someone’s ribs). Hmmm? Anyone else have this experience? And only you know what that sharp elbow feels like. My wife can do it with a look, so pay attention; but also, any offer you assemble will have a greater chance of acceptance if the sharp elbow gets employed. Here is where you as a buyer, win!